As one of the greatest love stories ever told, “Lady and the Tramp” is sure to melt the hearts of generations with its beloved characters, brilliant animation, memorable music and sweet sentiment. Every member of the family will treasure this timeless tale—loaded with three versions of the film, classic bonus material and three all-new features—when it heads home on Digital and on Movies Anywhere Feb. 20 and on Blu-ray on Feb. 27! 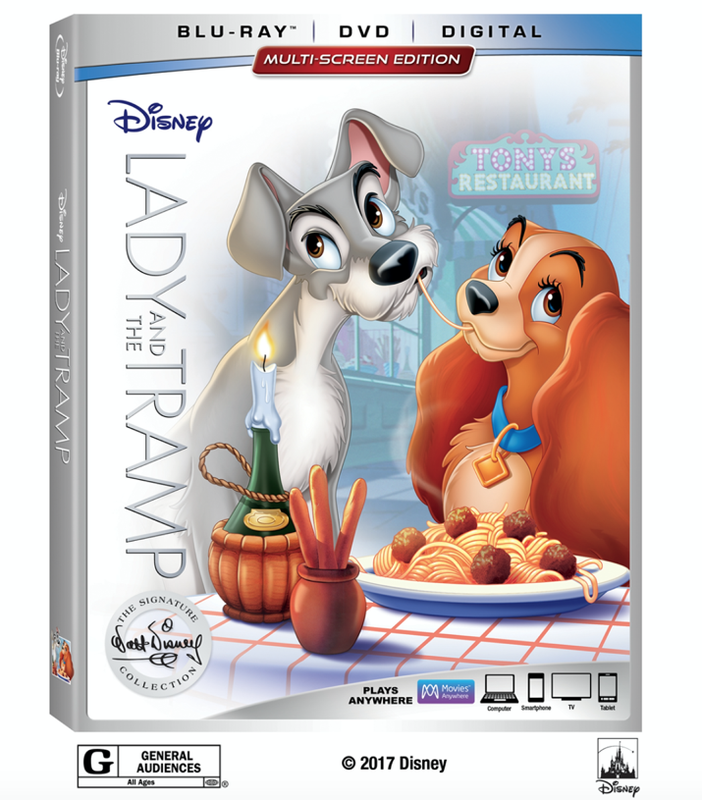 Lady and the Tramp Signature Colleticon is available now on digital and available on Blu-ray February 27th at retailers near you. You can also pre-order from Amazon here. I am not sure why Maggie has her tongue is out. 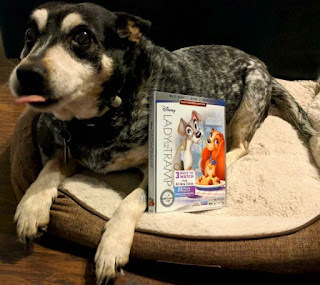 I don't often write product reviews but when my owner received a movie dedicated to dogs, I had to watch it with them...so why not give my thoughts! As a fellow dog and former pound dog, I could relate to some of what went on with Lady. In the beginning, I did not have as fancy of a life as Lady, but once my current family brought me home, I soon learned what love and a nice family/home truly was. My family already had kids, so new baby for me...but a few years later then brought in a new pound puppy and then a stray kitten. So like lady, I had to learn to be tolerable and accept changes. I enjoyed watching this film with my owners, I got a lot of cuddles, head pats and of course when they ate popcorn, I had to give them the sad eyes and then they gave me some too. Whether you are a pound puppy, a pampered princess of a dog or a lovable dork of a dog, you will enjoy this film with your owners. Now after watching it...I must find me a male dog to recreate the spaghetti scene! Until next time. • Original Theatrical Edition – Enjoy this cherished Disney classic that captivates audiences of all ages. • Sing-Along Mode – Sing along with all your favorite songs as you watch the movie. • Inside Walt’s Story Meetings – As you view the film, hear reenactments of Walt’s story sessions with animators and see how their ideas were realized on-screen. • Walt & His Dogs – Through archival recordings and photos, hear the tales of the dogs Walt Disney owned and loved over his lifetime. • Stories from Walt’s Office – Take a tour of Walt’s office suite on the Studio lot, carefully re-created to look just as it did when he occupied it. • How to Make a Meatball and Other Fun Facts About “Lady and The Tramp” – Watch a delicious lesson on how to make perfect meatballs with teen chef Amber Kelley and Oh My Disney Show Host Alexys Gabrielle. • Diane Disney Miller: Remembering Dad – Walt’s daughter shares memories of her father and Disneyland’s early days, as well as a look at his apartment above the firehouse. • Never-Recorded Song - “I’m Free as the Breeze” – Take a listen to a song originally meant to be sung by Tramp. • Introduction of Boris – Tramp wasn’t always meant to be Lady’s only suitor. Meet Boris the aristocrat and Homer the peasant in this deleted scene. • Waiting for Baby – Lady watches as Jim Dear plans out his new son’s future in this early storyboard. • Dog Show – See the storyboards for this deleted scene in which Lady and Tramp unexpectedly find themselves in the middle of a dog show. 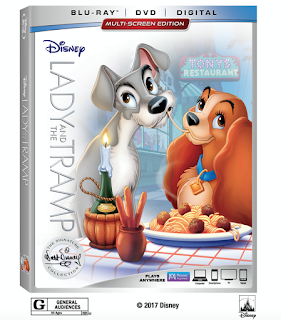 • Lady’s Pedigree: The Making of “Lady and the Tramp” – A behind-the-scenes look at the making of Walt Disney’s first feature-length animated film based on an original story. • Finding Lady: The Art of the Storyboard – Explore the origins of the storyboard and how they’re used by filmmakers today. • PuppyPedia: Going to the Dogs – Wild and wacky comedian Fred Willard takes us on an outing to the dog park to learn all about dogs and their owners. • Turning the Tables – In this story-reel presentation, Tramp dreams of a world where dogs run the show and humans are on the other end of the leash. • The Arrival of Baby – In this alternate scene re-created from original storyboards and with original voice talent, Lady makes way for a new arrival. • Baby Arrives – Lady is baffled by the strange goings-on in the house—the arrival of a squealing bundle only deepens the mystery. • Lady’s Sweater – Lady gets a new sweater for her birthday and must figure out an ingenious way to lose it for good. • 1955 Original Theatrical Trailer – More than just a trailer, this preview features several minutes of footage from the film and introduces each major character. • 1986 Theatrical Re-Issue Trailer – Released theatrically for the 1986 holiday season, this trailer highlights the love story between Lady and the handsome Tramp.